"It seems they know me. Amazing and frightening at the same time." "No lie, my brain just got completely ****ed. Do this. My jaw dropped." "This is one of the coolest marketing campaigns I've ever seen. Seriously." "Viral marketing. You're doing it right." "We're not for everyone. 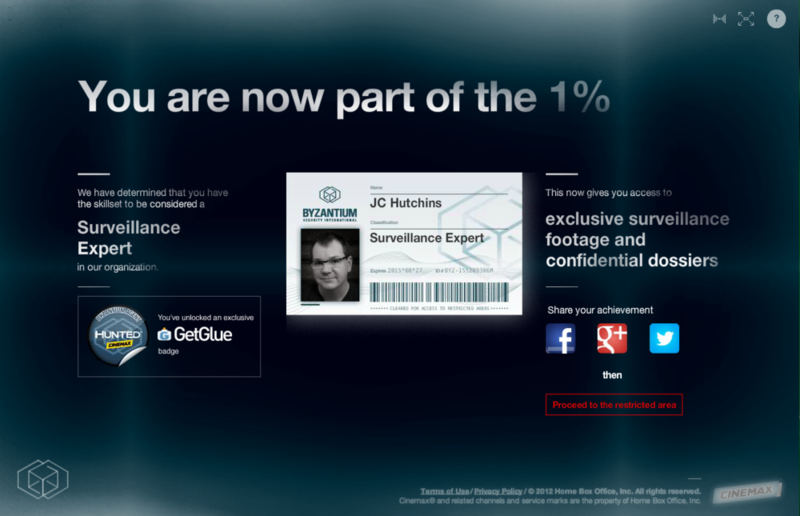 Just the 1% that matters." In 2012, Campfire hired J.C. to help craft Byzantium Tests, an immersive themed experience for Cinemax's original spy thriller series, Hunted. Using psychological principles such as the Forer effect, interactive storytelling and good old fashioned sleight of hand, they crafted an experience that became an online phenomenon. 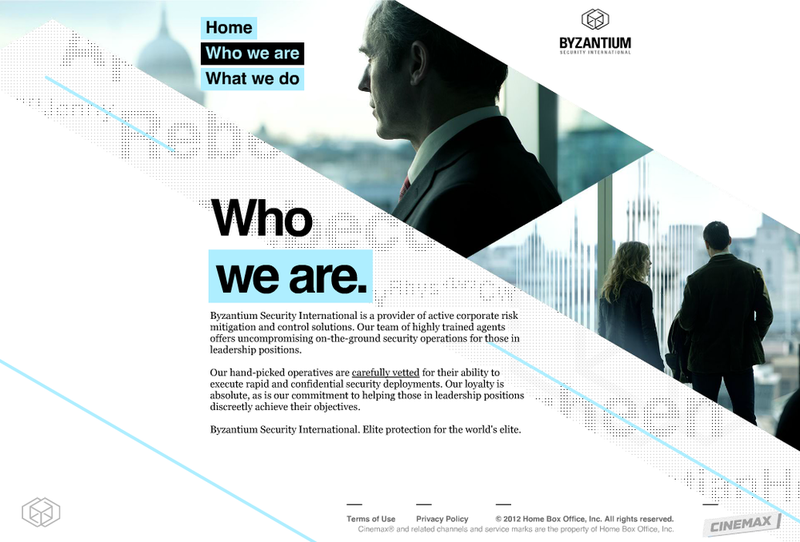 Byzantium Tests featured a seemingly-legitimate website for Byzantium Security International, an elite corporate security firm seen in Hunted. The experience also featured a curious "recruitment" site in which visitors could take a series of increasingly-strange cognitive tests ... and become a Byzantium employee, if found worthy. Campfire's Creative Director Steve Coulson and J.C. worked closely with a psychologist and illusionist to ensure each test evoked the intended sense of intrigue, uncertainty and eventual distress. 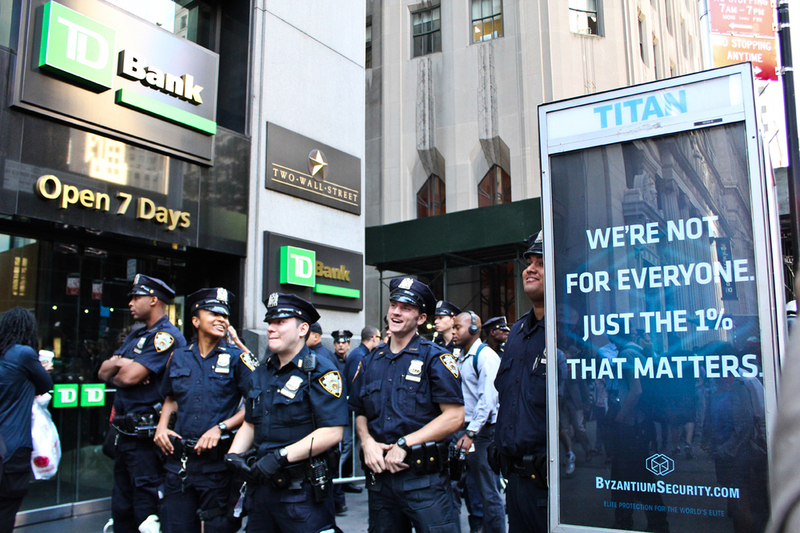 Byzantium Security International's deliberately scandalous slogan — and the "in world" OOH adverts placed in New York's financial district — struck a chord with many, especially those protesting during Occupy Wall Street's one-year anniversary. Photos of the posters — and soon after, enthusiastic reactions to the online prequel — were quickly posted to CNN and the Huffington Post ... and then blogged, reblogged and retweeted thousands of times to hundreds of sites across the web. 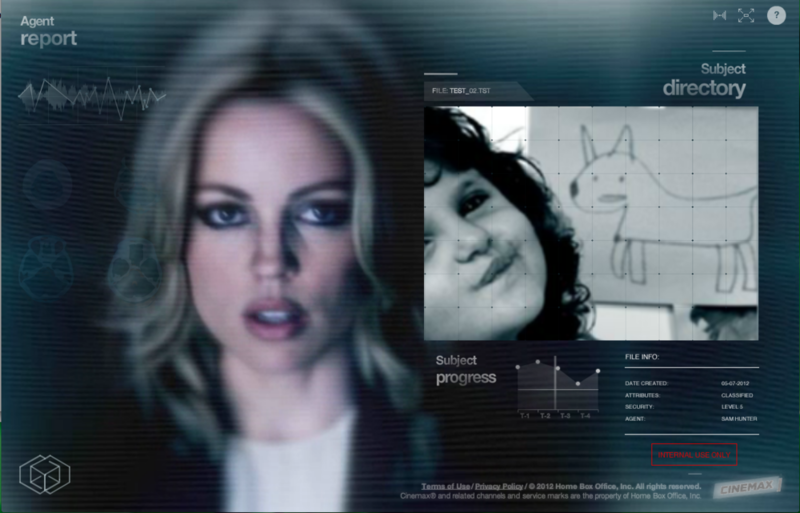 The prequel's five-stage "recruitment" site propelled visitors increasingly deeper into the unsettling and uncertain world of espionage, something familiar to Sam Hunter, the show's protagonist (whom participants meet in this experience). What begins as an innocuous "Are You Normal?" multimedia personality quiz concluded with a mindbending twist that left nearly every participant reeling ... and keen to share the experience with their friends. So spectacular was its reception, Byzantium Tests found itself on the front page of Reddit multiple times. The Byzantium Tests site soon received over 1 million unique visitors. It received coverage in Wired, Creativity, Google's Creative Sandbox showcase and other publications. 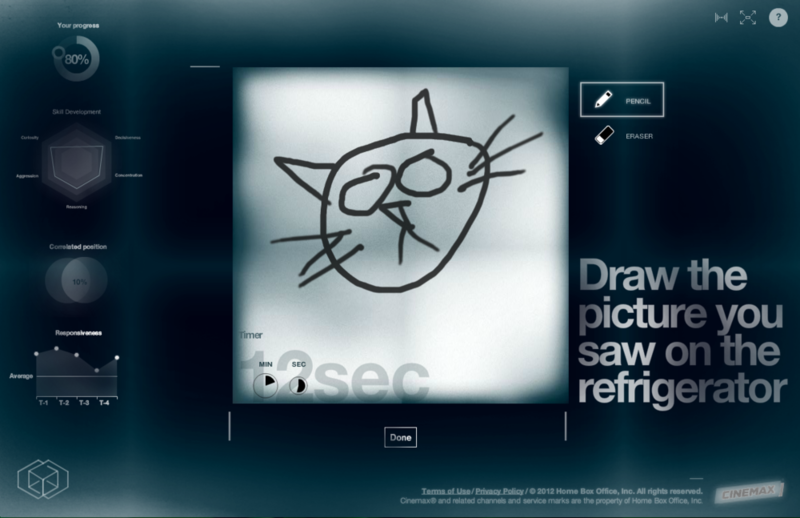 It received a silver CLIO award in 2013's Games category, and was Ad Age's Small Agency awards' 2013 Campaign of the Year. 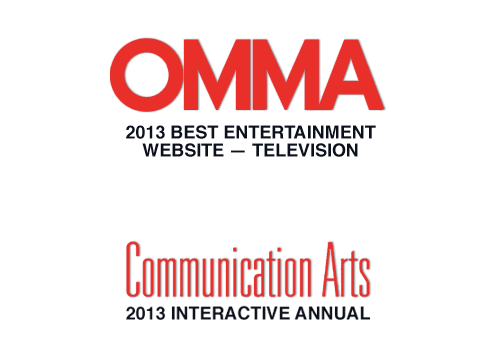 It was also a winner in the "websites/microsites" category of Communication Arts' prestigious Interactive Annual. 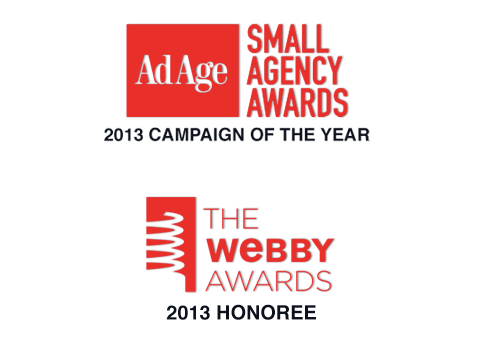 The campaign also claimed Best Entertainment Website and Best TV Rich Media Online Campaign honors in the 2013 IAC Awards. Most recently, it won silver awards in the Website and Best Campaign categories, in The Hollywood Reporter's 2013 Key Art Awards. Byzantium Tests was also a 2013 Webby honoree in the Integrated Campaign and Media & Entertainment categories, and won the Best Advertisement award at FITC Toronto 2013. Especially impressed was the show's creator. In a December 2012 interview, The X-Files executive producer and Hunted creator Frank Spotniz proclaimed, "I’m so thrilled by that campaign. It was so brilliant and so clever. ... It wasn’t just advertising or marketing for a TV show. It was an experience people enjoyed." J.C. was Byzantium Tests's writer; he also contributed to its experience design. J.C. helped craft the prequel's narrative arc and tests. He wrote Byznatium's corporate website copy and video screenplay, the test environment's on-screen copy and scripts, and "dossier" content that connected the campaign to events seen in Hunted's premiere.